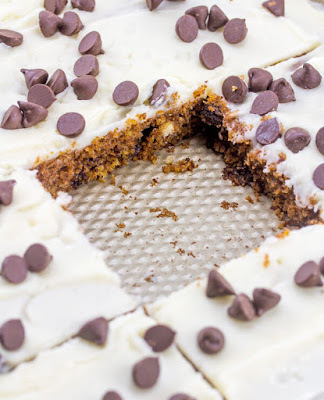 This chocolate chip cookie Dough Sheet Cake takes the one of my favorite guilty pleasures and turns it into a Texas style sheet cake. You are going to love it! 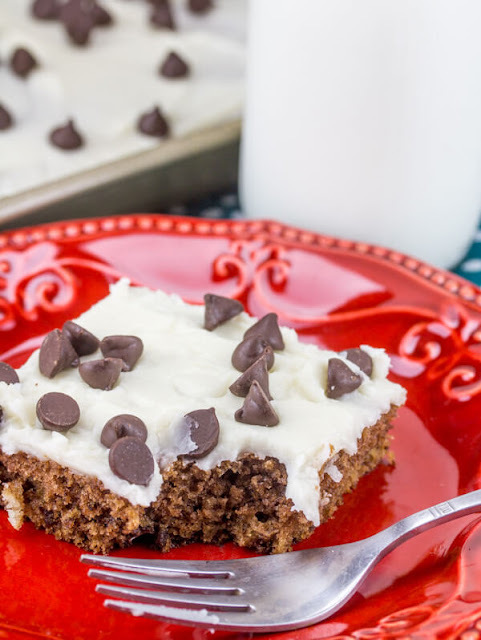 A simple to make Texas style sheet cake that tastes like chocolate chip cookie dough. It's a dessert lover's dream come true! Get out your saucepan and whisk out, that's all it takes to make this delicious treat. It will be perfect for your parties, BBQs, potlucks and more! Maw-Maw and Paw-Paw were coming for a visit on Labor Day weekend. The guys were in charge of manning the grill and smoker for the weekend. I was the dessert committee. I wanted to try making a homemade chocolate chip cookie dough ice cream. 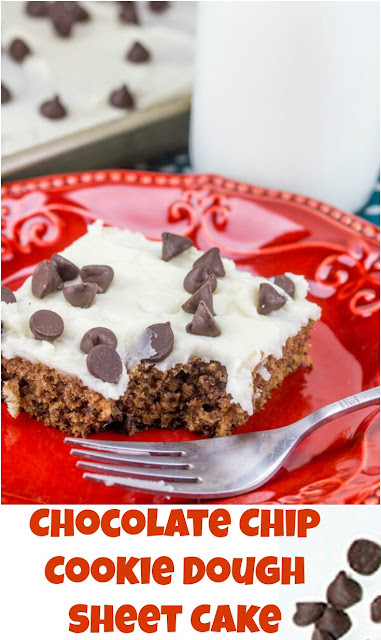 Since I have been excited about creating new Texas sheet cake recipes I thought it would be fun to make a chocolate chip cookie dough flavored sheet cake. I am especially proud of this one. It took a lot of thought to come up with the perfect recipe. I did not want this to be like a cookie but rather a cake that tastes like cookie dough. Cookie dough and brownie batter are two of my favorite things. It doesn't seem right to serve a bowl of cookie dough to your guests, so this cake was the best alternative. To top it off, I came up with a cookie dough flavored icing. You will not believe how good this is. IF YOU LIKE CHOCOLATE CHIP COOKIE DOUGH, YOU SHOULD TRY THIS! MiMi is right to be proud of this one. It was a fun idea and she did great on the execution. Despite the fact we were all full from a delicious dinner, nobody had a problem finishing their portion. My sisters were both happy to take some home with them as well! 1. Preheat the oven to 375 F and grease a 12x18x1 half sheet cake pan.2. Bring butter and water to a boil in a large saucepan.3. Remove from heat and stir in the remaining ingredients excluding the chocolate chips. Let the batter cool for a few minutes, then stir in frozen chips.4. Pour into prepared pan and bake for 22 about minutes or until done.5. Cool for about 20 minutes before frosting the cake.6. For the icing, bring the butter and milk to a boil in a large sauce pan.7. Remove from heat and stir in the vanilla extract and powdered sugar. 8. Spread warm icing over warm cake. Let cool for a couple of minutes and then sprinkle with the remaining chocolate chips. Let cool completely before serving. Oh, I have a sweet tooth and this page is full of some very yum looking desserts. I might have a slight sweet tooth too ;-) Thanks for stopping by! YUM!!!!!! Another delicious recipe added to my to make soon list. It's a good one, that is for sure! Not quite as healthy as the pumpkin ice cream though ;-) But you have to treat yourself sometimes! Hi Carlee, this cake looks so good! Thanks for sharing these awesome recipes and your your visit today. Oh my.... definitely pinning this! I LOVE Texas sheet cakes, and this one looks phenomenal! Thank you! We have been having so much fun making some variations on the Texas sheet cake this summer, but I think this one might be our favorite yet! Hi Carlee, All your sheet cakes look seriously yummy, I want to make them all !We're huge Cookie Dough fans here, and it would make the perfect dessert for our first Fall weekend to enjoy! Thank you for sharing! Wishing you a fun weekend! Thanks, Christine! We have definitely been on a sheet cake roll this summer! This looks so stinkin' yummy! My family is a huge fan of anything sweet, but chocolate chip cookie dough is eaten so quickly, it's ridiculous! I know they'll love this!! YUMM!! I hope you try it and love it!! I know it was a hit at our house! YUM! I may or may not be drooling right now! This cake is certainly drool worthy! MiMi really knocked it out of the park. Thanks so much for hosting! Hi Carlee, wow this sheet cake is something that my daughter would love! Thanks for sharing this awesome cake recipe at Cooking and Crafting with J & J. You'll have to let me know how she likes it if you try it. It was a smashing success with our family! Thanks so much for hosting and for stopping by! You had me at chocolate chip. And cookie dough. And cake. This sounds and looks delicious! So drooling over here. ;) Pinning for sure! Thank you so much for sharing this with us at Merry Monday! Amen! I love all of those things separately too, so I knew it would be a hit all together! Thanks for stopping by! It is so good! You'll have to make it after your next grocery run! Congratulations Carlee, this yummy post was in the TOP SIX most clicked (or licked) on Fridays Blog Booster Party #24. It will be FEATURED on Friday. Dang... This sounds great! The guys at work have been feeling left out lately on my baking. At least with a sheet cake, there is enough my husband won't mind when he loses half of it. Or will he? Lol... either way, I have to try this! Thank you so much! I will be heading your way soon!! This would not last long at my house! Yum! Thank you so much for linking up at Tasty Tuesday! This post has been pinned on the Tasty Tuesday Pinterest board! I love having you and can't wait to see you next week! It didn't last long at ours either! It is always so much fun when you think of an idea and it actually comes together like you imagined it! Thanks so much for hosting! You had me at Chocolate Chip Cookie Dough..........a weakness of mine. Mine too! I can't keep my hands out of the stuff! This cake really hits the spot! 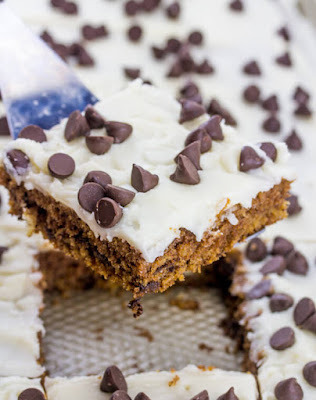 We love chocolate chip cookie dough, and I don't think this cake would last for long in my house! I'm sure it won't! It is soooo good. Cookie dough is one of my absolute favorite flavors! I'm a huge sheetcake fan and this sounds amazing. Thanks for bringing this to Throwback Thursday! I love sheet cakes too! They are so easy and great for a crowd. This is our new favorite! This looks delicious, Carlee! Gloria is a big fan of cookie dough anything. She's going to love this recipe. Pinned and Tweeted. Thanks for sharing at Snickerdoodle Sunday! I hope she loves it! Thanks! Carlee this looks so good! I'm a big fan of sheet cakes.. so easy! Thanks so much for linking up with us at You Link It We Make It! Thank you! I love sheet cakes too! No worry about them coming out of the pan in one piece and I love that they come together in a saucepan. Thanks for hosting! Yes! I need to make this again soon. Everyone enjoyed it so much that they still bring it up in conversation. This cake was a big hit! Oh, this cake looks amazing! What a great idea to turn cookie dough flavor into a cake :). Thanks for sharing at You Link It, We Make It! Hope to see you back tomorrow, pinning! Thank you! I'll see you tomorrow! This is sheer genius! I love cake, I love cookie dough, I KNOW I'd love cake that tastes like cookie dough! Thank you!! It is one of our favorites! Hi Carlee, I love brownies, but am not sure what cookie dough is. Well I do know, but I'm not sure how it's eaten. Is it just a mix of cookie dough before it's cooked? I do nibble dough when I make cookies or biscuits but I'm not sure how a bowl of raw dough would go down! I've probably got it all wrong. This sheet cake would go down well with me, but then again most things you create would! Oh my gosh, this looks spectacular! I love, love, love me some cookie dough, so this is right up my alley :-) The pictures turned out gorgeous too Carlee! Me too, cookie dough = happy!! Thanks so much, Jessica! me too! It's one of my favorite guilty pleasures! Wow! This looks scrumptious! Perfect for a summer treat!!! Thanks, Liz! That means a lot coming from you! Carlee, Girl! What are you doing to me??? I haven't had breakfast yet when I decided to pop by and see what you're up to in the kitchen. Now my stomach is growing! I would love a slice, or two, of this to go with my morning coffee. Who am I kidding? I would make this whole thing and then have it for breakfast, lunch and dinner. Is there anything better than chocolate chip cookie dough? UM... pairing with another favorite, sheet cake! YES! You don't ever have to talk me into cake for breakfast! We could totally make one and have it for every meal of the day with no complaints. Thanks, Nikki! This is a great sheet cake it looks delicious! Thanks so much for sharing this awesome post with us at Full Plate Thursday. Hope you are having a great day and come back soon! sounds tasty and it's pretty! Thanks for sharing on the What's for Dinner link up! You can serve me a bowl of cookie dough when I come to visit Lol. We all love cookie dough around here. It sounds like a cake we would all really enjoy and we are looking forward to trying it. It looks fantastic!! Thanks for sharing. hehe! One big bowl of cookie dough and a couple of spoons coming right up!